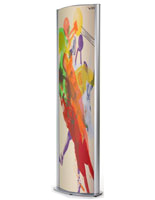 This Tall Snap Frame can display six posters! This tall sign holder captures audience attention! This 8 foot tall sign holder is elegant with a smart design. Double sided with 6 total poster frames, it is truly an impact advertising tool. This tall sign holder towers above most retail stands and still saves floor space! The tall sign holder is height adjustable along the display stand pole, and front loading snap frames make poster changing a breeze! Built on an aluminum frame, this is a heavy duty unit with a strong, stable base and pole. Large sign stands like this are most effective in open indoor areas with significant pedestrian traffic. This tall sign holder is best suited for trade shows, conventions, shopping areas, banks, universities and lobby entryways. Snap frames are great for frequent graphic changes. 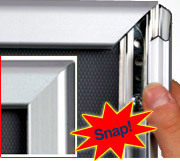 Simply snap open the four frame sides and place the 22"w x 28"h graphic behind the clear plastic lens. The non-glare lenses protect the artwork from damage. Poster Frame installation and height adjustments are simple using the screws on the channel plates behind each frame to install or adjust the height. You advertise to draw attention to your message. This tall sign holder creates great impact for your graphics! 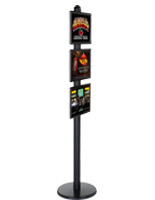 Order this tall sign holder today for a new look!